Bba_K1314001 is comprised of nifH promoter and Bba_E1010. It is designed for testing nifH promoter. 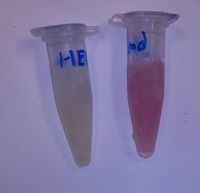 The right tube shows the expression of RFP using ptep promoter in Dh5a and the left tube show the expression of BbaK1314001 in DH5a. The result show that nifH promoter is not working in DH5a.